Titanium is a light, strong, lustrous, corrosion-resistant transition metal found in everything from spacecraft to artificial hips. Since its inception into widespread industrial use, manufacturers have commonly chosen to use stainless steel brushes on titanium parts. 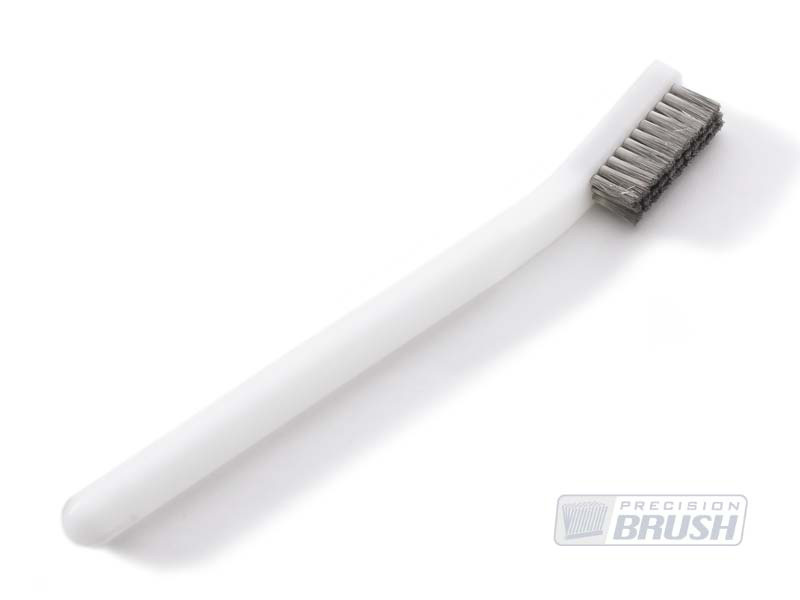 However, Stainless steel brushes are not always the best option for use on titanium parts. When a stainless steel brush contacts a titanium part, trace amounts of stainless steel are stripped from the brush fiber and become embedded into the titanium surface. This binds the two metals, and when moisture is added, a battery is created and galvanic corrosion can occur. By definition, galvanic corrosion is the act of two dissimilar materials coupling in a corrosive environment. When this occurs with stainless steel and titanium, the stainless steel acts as an anode and corrodes quicker than it would normally, while the titanium becomes the cathode and corrodes more slowly that it would normally. The actual extent of the corrosion depends on the efficiency of the battery—with the amount of potential voltage being determined by the difference in voltage potentials of each of the two coupled metals involved. Choosing pacified stainless steel, which is closer to titanium in the Anodic Index (metal materials listed by their free corroding potential relative to a standard electrode) is a better solution, but there is still potential for galvanic corrosion once the protective oxide becomes abraded away. The best solution for brushing titanium parts is simple: titanium brushes. Without dissimilar metals there is no potential for the formation of a battery and therefore no galvanic corrosion. Titanium brushes are highly recommended for non-temperature or non-humidity controlled environments, like warehouse, and are absolutely essential to processes in outdoor environments where the parts can be exposed to the elements. Referencing the Anodic Scale, a potential voltage difference of .50 V is acceptable in indoor, temperature and humidity-controlled environments. For harsher environments, no more than .15 V is acceptable. Important Note:Operators must observe common safety practices at all times. This includes wearing goggles, proper use of machine guards, observing any speed restrictions, wearing appropriate protective clothing and complying with ANS-B165.1 - 1979 "Safety Requirements For The Design, Care And Use Of Power Driven Brushing Tools."